We were asked by Pippa, who runs Labrador Store, if we'd be interested in working with her to create an Edition - a special collection of 15 pieces which would somehow transcend the division between the sculptural object and the functional object. Our answer was, yes, of course! For a while, Matt had been itching to get his hands on (or in?) some porcelain, and I had been romancing over the prospect of gathering wood ash and creating some new glazes. So this is what we did. I'm not sure if Matt is capable of creating anything less than perfectly pure and simple in form. 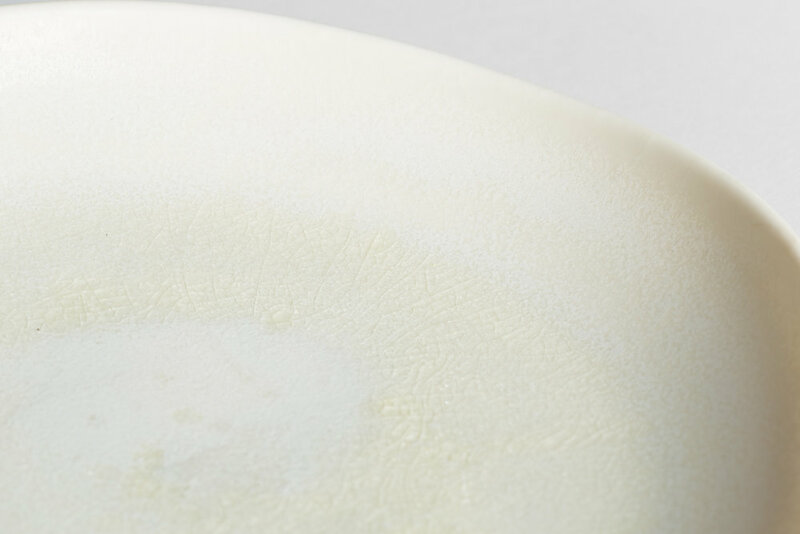 Although porcelain proved to be a completely different material to work with than our usual stoneware clay bodies, Matt produced some really gorgeous prototypes to work with, and it soon became apparent that we wanted to create a form that would act as a kind of 'plinth' for the glaze. The result is a bowl-like shape with three feet in the base (which are revealed via a labour intensive process of trimming away leather-hard clay. My dad built his own wood-fired bread oven in his garden and we gathered some wood ash from it after a pizza party. We think the wood is mainly from willow trees which grow vigorously by the stream at the bottom of my parents' land. With ash, you can be very specific about when the tree was cut and how long stored and dried, and so on, as it is said that these factors alter the nature of the glaze. I don't have this information for this project, but it is something i'm interested in for the future. I decided to work with 5 different variations upon one glaze. One is pure wood ash with water, which ended up being this gorgeous dribbly green; the second is wood ash over a simple matt white glaze; third is a smooth, glossy ash transparent over a tenmoku style glaze; fourth is a rusty, semi-matte glaze with ash and red iron oxide; the fifth has no ash, but is a crystal glaze with rutile and red iron oxide. Can you see a pattern (I love red iron oxide!)? We fired to 1280 degrees with a long soak and slow cool down. Perhaps we should have anticipated this, but our perfectly round plates completely altered shape in the firing. I opened the kiln to much delight, simply in love with these organic shapes and seriously interesting glazes, but Matt, the lover of regular and perfect forms, has taken a little longer to win over. For me, the whole project has been one of experimentation and unexpected results - we applied the knowledge we had learnt from studying books, combined with instinct and chance - and the results are quite pleasing. Further adventures in wood ash and porcelain coming soon! The plates are available to buy from Labrador Store.